We describe our service as a non-custodian, decentralized service for self-management and tracking of index-based cryptocurrency investments. We will never hold your funds, we will only help you swap them following an index-based strategy. We use decentralized exchange technology removing the risks of centralised exchanges and providing full privacy. Only if you choose so, we can keep track of your wallet activity and help you analyze how your investment is doing. We provide you with tools for you to buy/sell tokens following an index-based investment strategy. 1- You have some Ethereum in a wallet like Metamask, Ledger or Trezor. And you want to reduce or distribute risk by following an index-based investment strategy or simply diversify your investment. 2- You use our service to swap some of your existing tokens for one of the collections of tokens suggested (or you can build your own!). 3- You come back over time to either re-balance your portfolio, understand how it is doing or simply fold on your investment. 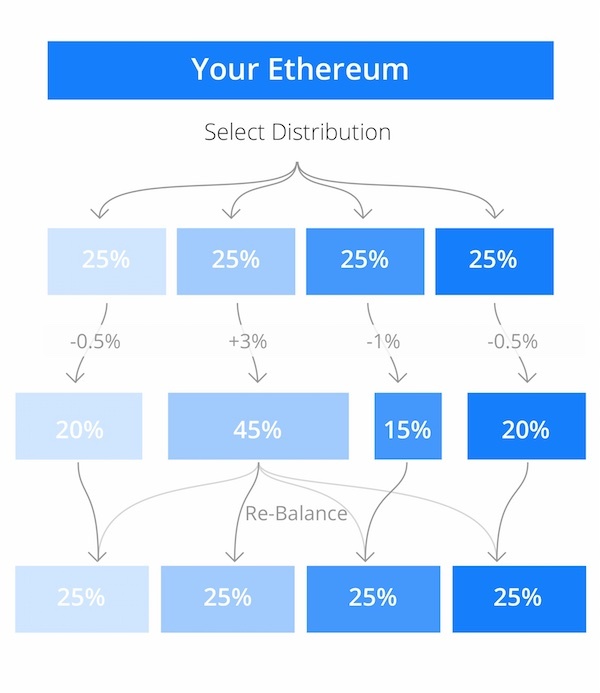 How much Ethereum would you like to diversify? How would you like to distribute your investment? We will let you know when we launch it!